Cat Fred and goose Anabel have enjoyed a wonderful summer in each other’s company. But then autumn arrived. Anabel started to get cold and had to fly south. 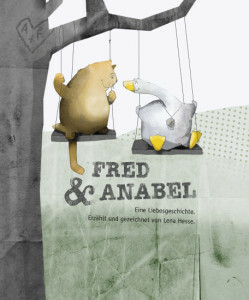 But Anabel can’t bear to be without Fred. And Fred misses Anabel, too. After all, spring follows winter. And it turns out that Anabel and Fred weren’t really that far from each other, because they were always in each other’s thoughts. A heart-warming story about friendship, separation, desire—and love. The cartoon movie won the Prix Éco Bambins and is shown in France, Poland, Denmark, Ireland, Belgium, Iran, Pakistan and Canada.